Drivers of the No. 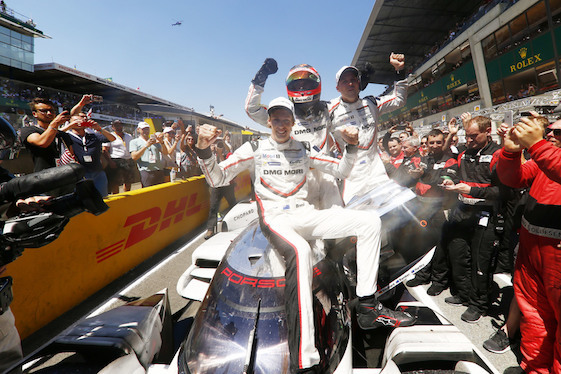 2 Porsche 919 Hybrid celebrate after winning the overall championship at Le Mans on Sunday. With all three of the faster Toyota TS050-Hybrids running into problems, the No. 2 Porsche 919 Hybrid stayed relatively healthy and sped off to the overall victory in the 2017 24 Hours of Le Mans race on Sunday. Driving the winning car and giving Porsche 919s their third straight win in the final stint was German Timo Bernhardt. Sharing the cockpit over the weekend were Brendon Hartley and Earl Bamber. The victory extended Porsche’s race-record victory total to 19 and it came even thought the winning car suffered and early front-end problem and needed almost and hour’s worth of work to get it back on track early-on. So dramatic were the favored Toyota problems, and with the other Porsche 919 having also dropped out, that the LMP2 machines finished second through eighth overall. The lone running Toyota – the No. 8 with Sebastien Buemi driving, – finished ninth and 10 laps off the pace. First among the LMP2s – and finishing second overall – was the No. 38 Jackie Chan Racing (yes, that Jackie Chan) with Ho-Pin Tung, Oliver Jarvis and Thomas Laurent. The Vaillante Rebellion Oreca-Gibs was second in class, third overall. The No. 37 Jackie Chan Oreca was third and fourth. The closest racing for the class win was in GTE Pro where the No. 63 Corvette C7.R battled the No. 97 Aston Martin Vantage. On the final stint, the Corvette, with Jordan Taylor driving, had Jonathan Adam’s Aston Martin on his rear bump for lap after lap. But big moments began with just five minutes to go when Adam attempt to make at pass in the low-speed Arnage Corner, overcooked, made contact with Taylor and then fell behind. A couple minutes later, Taylor blew though a gravel trap chicane and came out of the trap just barely ahead of Adam. Shortly thereafter, Taylor slowed with a puncture as a result, Adam blew past and Aston Martin had the win. Also passing Taylor on the final lap was the No. 67 Ford GT of Chip Ganassi Racing with Harry Tincknell at the wheel. In GTE Am, Ferrari 488s swept the podium with the No. 84 of JMW Motorsports (Robert Smith, Will Stevens, Dries Vanthoor driving) occupying the top step. The green flag dropped under clear skies but very warm temperatures. And it did so with the trio of Toyota TS050 Hybrids substantial favorites to claim the marque’s first overall victory as they had shown huge speed all month at the circuit. Next in the lineup of favorites were the two Porsches and, finally, the lone other prototype in the 58-car field, the ENSO CLM P1/01 of Bykolles Racing. The significant incidents began in the fifth hour as teams and drivers who were believed to have chances at podiums, if not victories, began to fall. The first of those was the America-based GTE Pro No. 82 Ferrari 488 of Risi Competizione and with Pierre Kaffer at the wheel. It was was cut off and guided into the Armco. The car was destroyed. Then came a faithful eighth hour. In that hour, the WEC championship leading No. 8 Toyota TS050 was forced to the garages with mechanical problems. The car was fixed but when it came back out, it was many laps down and, for practical purposes, out of contention. Also in Hour 8, The No. 64 GTE Pro Corvette, with Tommy Milner at the wheel, lost a rear wheel, spun into gravel, hit the wall and had its hopes ended. Next to fall was a second Toyota Hybrid as the No. 8 pole-sitting car rolled to a stop. The third Toyota had trouble in Hour 11 when it was spun into a gravel trap. The car suffered a destroyed left rear tire and had to limp all the way around the huge circuit with tires cords tearing up the bodywork. Just before pit entry, it succumbed. In Hour 14, the No. 92 factory Porsche 911 RSR GTE Pro car – with Michael Christensen driving – spun and wrecked and joined the Risi car in the “retired” column. In the 15th hour, veteran driver Emmanuel Collard lost it in the Porsche curves, blew through the gravel trap and slammed the barrier. That brought out a half-hour safety car situation. In the 18th hour, The No. 95 Aston Martin Vantage, which was running second in GTE Pro overcooked the Mulsanne Corner, sped through the gravel and hit the barrier and saw its chances killed. Then came an Hour 21 which put the overall victory up for grabs. The No. 1 Porsche 919 Hybrid, with Andre Lotterer at the wheel and a huge lead, slowed to a stop with a dead engine. That put the Jackie Chan Racing Oreca-Gibson LMP2 car into the overall lead. Behind him and a lap down was the one remaining Porsche 919. The LMP1 Porsche began cutting 15 seconds per lap off that lead, got back on the lead lap with 2 hours to go and the race became a question of whether or not it could catch and pass the No. 38 Jackie Chan car. With just over an hour to go, and with Earl Bamber at the wheel, the No. 2 Porsche 919 blew past the LMP2 Jackie Chan car, which was being driven by Ho-Pin Tung. From there, all the leading Porsche had to do was stay out of trouble and hold together mechanically. It did and it did. “Magical to get the win today,” Bamber said. Fritz Enzinger, Porsche Vice President LMP1, said, “One of our ambitious targets for the 2017 season was to achieve a hat-trick at Le Mans. But what we have gone through over the past 24 hours, you could not imagine in your wildest dreams. This 24-hour race just pushed everything and everyone to the limit. It is unbelievable what you can achieve in a focussed team effort. Sometimes it is not the fastest car but the best team performance that makes the difference. This team is the best of all and made today’s success possible.